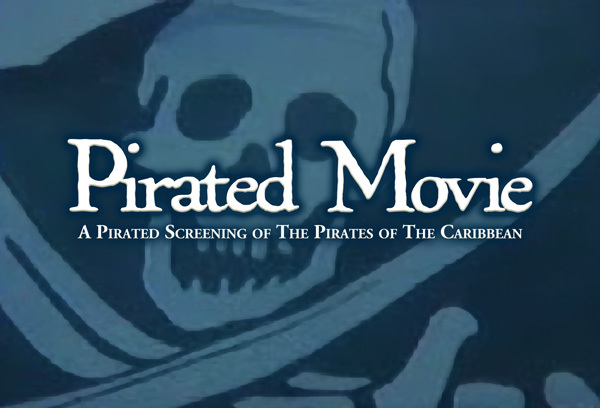 “Pirated Movie” is a screening of a pirated version of Disney’s “Pirates of The Caribbean, The Curse of The Black Pearl.” The pirated video will be screened in black and white and silently while five of NYC’s most interesting artists, DJs, and musicians provide a completely new soundtrack live during the screening. Tickets are 50¢ and will be available at the door. MTAA is a Brooklyn, New York-based conceptual and net art collaboration. Their examinations of networked culture, the economics of art, digital materials, and the institutional art world take the form of web sites, installations, sculptures, and photographic prints. Their work has been commissioned by The Alternative Museum, Creative Time, and The Whitney Museum of American Art’s Artport web site and has been exhibited by PS1 Art Center, The Walker Art Center and Eyebeam Atelier. Tinydiva will be performing an original composition inspired by piracy, with live accompaniment on the turntables. Tinydiva is a musician/producer who lives and works in Brooklyn. She has been involved with many music projects since the mid-90’s including Market, a downtown group whose shows combined live vocals, turntables, keyboards, and digital samples with film loops and video projections. Margaret has performed at many NYC venues such as the Roxy, Bowery Ballroom, Galapagos, CBGB’s and Fez. Pee in My Face with Surgery is a live performance duo that explores the liberation of the definitions of emptiness and the clogged distribution of aural quantity. Through a closed-circuit feedback system and the human voice, these distinctions become undermined as a simple bi-product of emotional response and psychological baggage. As the recycled air of a plane cabin changes states in the pressurization process, the group’s sound hovers in stasis to be released at points of intuitive excitation. Will be performing a live demonstration/turntable-lecture on the history of bootleg records. Naval Cassidy has been an instant cinema and sound performer for over a decade, working on his own and with Valued Cu$tomer (Stackable Thumb) and The Hands of Orlak. He has spent most of the last five years pulling delirious visions out of discarded broken objects as they are placed under the watchful eye of his camera. As accompaniment, Naval draws out bubbles of noise from computers and radio broadcasts. For this show he will concentrate his efforts just on computer bubbles. Cory Arcangel is a founding member of BEIGE [aka the Beige programming crew/Beige Records], a loose knit crew of like-minded computer programmers, and enthusiasts. Their work has been called “genius” by XLR8R magazine, and they were recently named in the NYTIMES best art moments of 2002 poll.Together they have pioneered the practice of recycling obsolete 8bit computers and video game systems to make art and music. When not dabbling with old computers or doing research projects about hacker culture, he sometimes makes work with his sister Jamie. In 1989 they founded theBuffalo New York based punk group “Insectiside”. Legendary documentation of their first [and last] world tour of Buffalo New York has recently been screened at Whitechapel Gallery in London, and at Ocularus in Brooklyn.